Whenever I have a lot of vegetables that need using I love to put them all in a pan and make a warming soup. Perfect for the cold days! Every week I get a lovely delivery of fresh fruit and vegetables from a local supplier so there is always plenty of vegetables in the fridge. My favourite soup to make at the moment is my All Sorts soup. This is, as the name says, a soup that is made up of all sorts of vegetables! Meat can be added or it can be left as a vegetable soup. It is such a versatile, full of taste, soup! Vegetables can be added or taken away, I use whatever needs using but you can also change the vegetables and meat according to taste. 1 - Chopped and wash all of the vegetables. 2 - Boil a large pan of water. 3 - Once the water is boiling add the stock cube, a sprinkling of mixed herbs and the vegetables. 4 - Bring to the boil and then simmer. 5 - Brown off the cubes of chicken breast in a little olive oil. 6 - After the vegetables have simmered for about 30 minutes add the red lentils and the browned chicken. The amount of red lentils can be varied according to taste. I add 2 cup fulls as I find that this is just the right amount to get the texture and the flavour in the soup. 7 - Bring back to the boil and then simmer. Cook until the vegetables are very soft and the chicken is cooked throughout. Then take off the heat and allow to cool. 8 - Once cooled blitz in a blender until smooth. Season to taste with a little salt and pepper. This should make you a large pan of soup which you can enjoy whilst fresh and also have enough to freeze for another time. 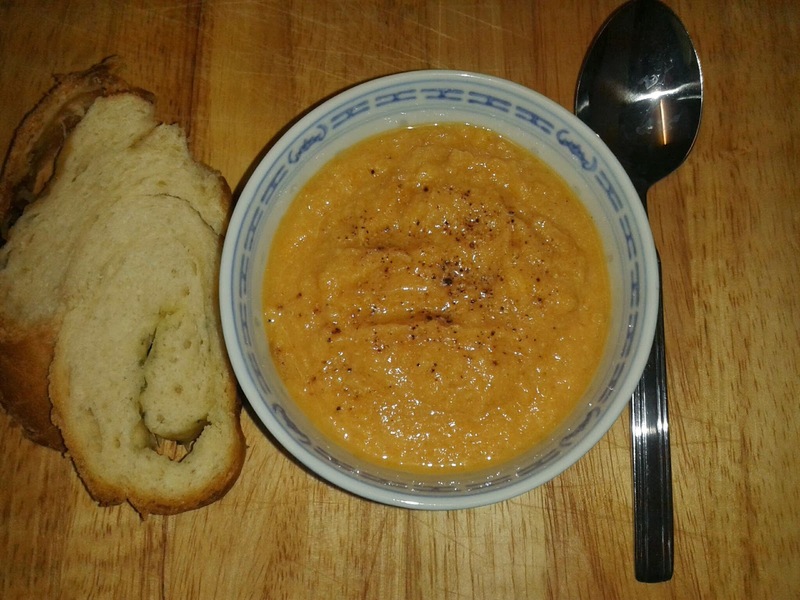 This soup is delicious with some warm freshly made bread and a sprinkling of black pepper. It certainly is a lovely warming lunch that is perfect now that the weather is getting colder.